Ah, 2017. A year of calling our representatives, frantically trying to protect the things important to us. The year of the Great Solar Eclipse (in the U.S.A.). The year of Harvey and Irma and other enormous storms wreaking havoc across the hemisphere. The year of the Equifax breach and the Patreon fiasco. A year where dozens upon dozens of high-profile men have been accused of heinous acts. But despite all of that, 2017 was also a year of less poverty, less world hunger, less child mortality, better education, lower crime, and other advances, because even as bad as it seems sometimes, we are getting better in a lot of ways. At the end of last year I’d made a resolution to read more. I did read a decent amount in December 2016 and for the first half of 2017, but it didn’t last all year. Part of the problem is a limitation I imposed on myself, deterring me from reading: I’m trying to diagram the story of one of my favorite novels, so I’m taking notes as I read. This added burden of “working” while I read feels like an extra barrier at first. It never actually bothers me once I start reading (and note-taking), but it’s difficult to get started. The bigger issue, however, is that I haven’t prioritized reading. 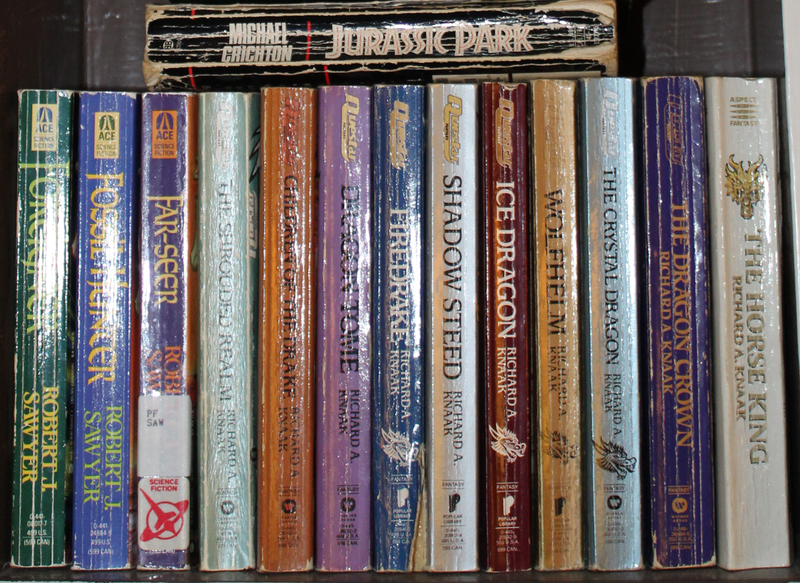 The Quintaglio Ascension Trilogy, the Dragonrealm Series, and Jurassic Park. These are all but one of my favorite books. Another thing I wanted to do in 2017 was draw more. I can’t improve if I don’t practice, a lot. But I don’t practice at all. I did end up with close to a dozen drawings in 2017, which is far better than 2016, but clearly it’s not enough. One drawing per day isn’t “enough”, but I can’t even get that far. I definitely played a lot of video games. Buu and I rung in the New Year in separate rooms: me playing Skyrim in the living room, him playing Diablo 3 in our office. We both played PokemonGO for several months, though changes to the game turned Buu & I off after a while. I bought a couple dozen games during the Steam sale in June, and have spent a few dozen hours playing them. And in the last month or so, I’ve gotten really into Hex, Shards of Fate. I also spent a good amount of time playing tabletop games. I ran a D&D game for a few months, and played a fair bit of Magic: The Gathering. We had Saturday Night Game Nights where friends would come over, and I’d either run the D&D game or we’d play Commander. We even played some Wizard School! At some point the guys stopped coming over, but Buu and I still went to weekly Commander night when we could, and to another friend’s house for Commander when possible. In fact, we rung in this new year playing Commander, so a Gamer I will always be! Buu and I went to the Renaissance Festival every weekend that it was in town, seven weeks in February and March. We went in-costume, of course, and bought a few more pieces for both of us. (Which I would then augment again later in the year from Amazon.) We got to see our friend Ash, and were introduced the marvelous restaurant that is Ginza Sushi, and their all you can eat sushi dinner. Buu and I also attended a small renaissance festival in Tavares in November, so we could visit our friend Ash (of Knightwings, Birds of Prey fame). We finally got to meet his wife Cryss, and we’re looking forward to seeing them both again in 2018. I bought a new camera, so I could take better photos while at the Ren Fest (and elsewhere). I really enjoy using that camera, and I think it was an excellent investment. I learned a lot and got a few great photos during the Solar Eclipse this year. I moved my website from Squarespace to WordPress in July. It took several weeks of intense work, but in the end I have far more control over my home on the web than I did before, and I really like what I can do with that power. I travelled for work four times: to Phoenix in April, Orlando in July, Roseville in October, and Orlando again in December. The roads in our neighborhood got repaved. Our mailbox was knocked over in the first pass (along with several of our neighbors’). For the second pass, the workers just came through and pulled everyone’s mailbox out of the ground before they even got started. Finally at the end of the year, Buu and I reburied the mailbox deeply enough that it doesn’t wobble anymore. We also finally cut down the scraggly hibiscus that was growing around the mailbox, so we have a clear view of it from the front windows now. Yay yard progress! At the beginning of the year, one of the splitters in the faucets tied to the washing machine started leaking, spraying a thin stream of water onto the dryer. Dad came over and replaced the splitter. Half way through the year, the other splitter started dripping, but we didn’t notice for quite a while. Dad came over to replace that other splitter today (1/2), so hopefully that’s the end of that. This happened in February, and my Dad came over and fixed it. Then the green one started leaking some months later, but we didn’t notice until around November. Dad has fixed that one now too. Good ol’ Mister Fix It. I tried my first theme with nail art, creating at least one design each month inspired by that month’s birthstone. It was more challenging than I thought it would be, and has dissuaded me from trying any additional themed challenges until I can devote a lot more time to nail art. I finally had to admit to myself that I can’t keep spending 5 hours a week on my nails, teasing out a new design every time. It’s okay to sometimes just paint my nails with one color from a single bottle, and admire the lovely color. I don’t have to paint the Mona Lisa every time. It’s okay to do this, self. You have over 300 colors of nail polish. It’s ALWAYS okay to just pick one and put it on your nails and be done with it. And, I spent a lot of time on social media. I watch a lot of YouTube (news, science, etc. all nonfiction), and spent a good amount of time on Twitter and DeviantArt. Hours and hours, every day. There were also some pretty major events in 2017. My brother passed away in May. There have been times in my life, years even, where he and I were close. But those years are long in the past, and he and I have not been on good terms for around a decade. We only found out that he was in the hospital a few days before he would ultimately die, with our mom, my dad, and myself by his side in Hospice, as he gasped his last breaths. I’ve been angry at him a lot over the years, and it’s only after his death that I can see what a terrible disease addiction is, and what it really did to him. I have a lot I’d like to say about my relationship with my brother, but that’s for another post. For now, I’ll say that I’m not exactly sad that he’s gone, but I’m very sad about what could have been. My parents were in a very serious car crash in August. Thankfully their seatbelts saved their lives, but my dad suffered a severe concussion, and my mom has ongoing pain and other issues. Plus their insurance is giving them a hard time about paying items that it’s definitely the insurance company’s responsibility to pay.. typical insurance company. My parents are lucky to be alive. Thank goodness we always wear our seatbelts! 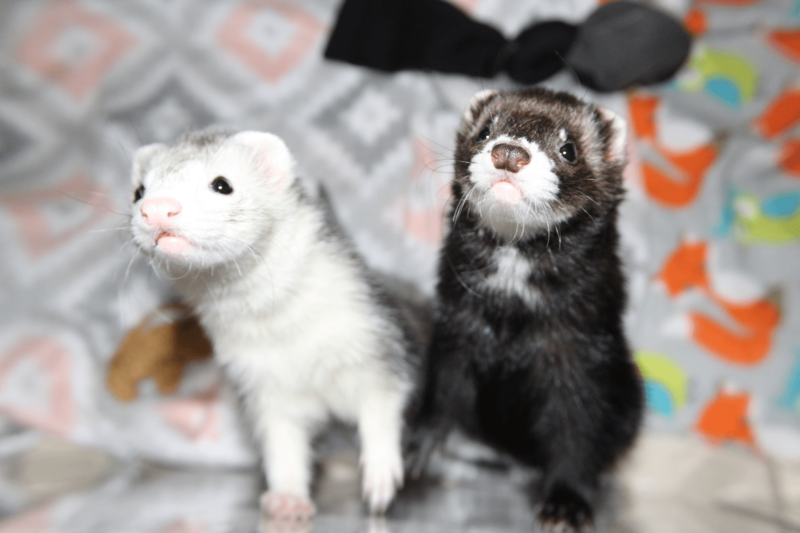 In happier news, Buu and I got two ferrets in May. Our sweethearts Opal and Onyx have brought so much joy into the house, I’m incredibly happy to have them. Of course, with pets come vet bills, and we’ve had a fair few of them this year. We also lost our AC in June. We’d already spent several hundred dollars getting it refilled when it locked up & froze over, only to have to replace the entire unit. We went six weeks without AC in the house (in FLORIDA, in JULY), only a window unit in the office. We hung a curtain across the opening into the office, and kept the ferrets in there as much as possible, to try to keep them cool. Replacing the AC was a huge chunk of savings that we were lucky to be able to cover. And along with this, we kept having to pay to have the septic tank pumped. In the end, we determined that we needed a new drain field. So there goes a few more thousand out of the savings account. So much so that instead of having more money in savings at the end of 2017, we had far less. This was my back yard a couple of weeks ago. I will eventually write a blog about this as well. But I can’t just blame that on all of the expensive things we had to take care of, and the fact that Buu is taking classes. No, we also spent money on stuff we don’t need. We both bought games during the Steam Sale, we bought Magic cards, DVDs, playmats, and whatever else we wanted. We didn’t pay any attention to any kind of budget, as long as we could pay all the bills every month. We didn’t prioritize saving. One of the themes in 2017 was a constant feeling of falling behind. Falling behind on social media, not being able to keep up with all the videos and podcasts to which I’d subscribed, not drawing enough, not reading enough, not finding enough time for laundry and other household chores. Always too much to do, and not enough time. Another theme of 2017 was spending. As I mentioned before, we had a lot of major bills, and Buu and I didn’t prioritize saving over spending. So for 2018, I’d like to correct the behaviors leading to both of these themes. I have a plan for both, and now it’s a matter of seeing if we can make the plan stick. More to come on what that plan is, and how we’re implementing it, in a future post.